Would You Like a Virtual Tour of Your Utah County Home? 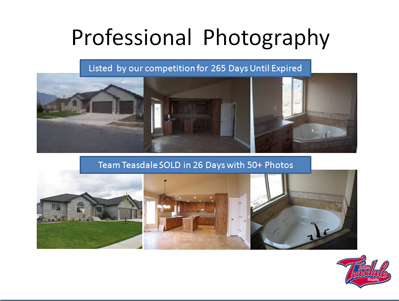 Team Teasdale Realty has been building its own professional virtual tours in Utah County for seven years. We got tired of the lackluster quality, time delays, and limited photography of the traditional virtual tour companies. Our tours are custom set into a slide show of your home. Your virtual tour is connected to your MLS ad and will appear on about 200+ websites throughout the internet. Buyers spend more time looking at homes that have virtual tours. Our tours look fabulous, and many Realtors have called asking to hire our virtual tour company. We politely decline making virtual tours for other agents. Hire a Realtor who can make you a virtual tour of your Utah County home. Visit our virtual tour homes in Utah County by following the "Our Lisings" link at the top of the page. If you want to take professional photographs that look dynamite, you need to spend around $1,500 on a professional camera and equipment. Many Realtors in Utah County just use a simple camera with limited abilities. The difference is huge. 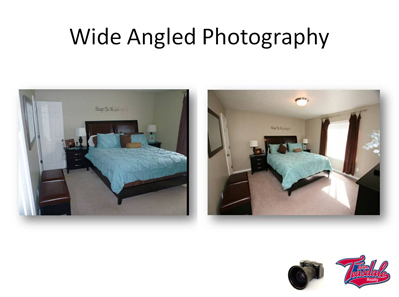 If you use a wide-angle lens, proper flash, and a professional photographer, you can make your home look amazing. Look at the example on the right. Our client, who told us she is a professional photographer, took the photo on the left. We insisted on a retake. Look at our photo on the right. The buyers can see a window, ceiling, and more floor. The second photo makes the room look so much more inviting. 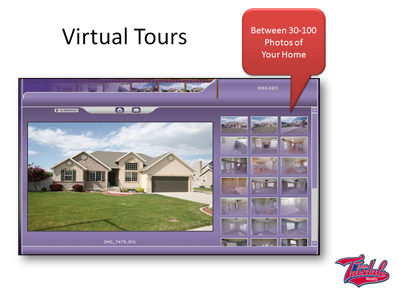 It is important to have a virtual tour of your Utah County home when you list your home. Dave Teasdale, our Associate Broker, is a professional photographer. We believe he has taken more photographs of the inside homes than anyone in Utah County. We estimate he has taken over 50,000 interior photos in the past seven years. He has many unique techniques and ideas in making your home look awesome. Photography is extremely important in selling a home in Utah County. More than 90% of buyers are surfing the web to find their next home. They carefully view the photos in making a decision whether or not to see the home. Let's get some beautiful pictures of your home in view of the buyers. Would You Like a Virtual Tour of Your Utah County Home?